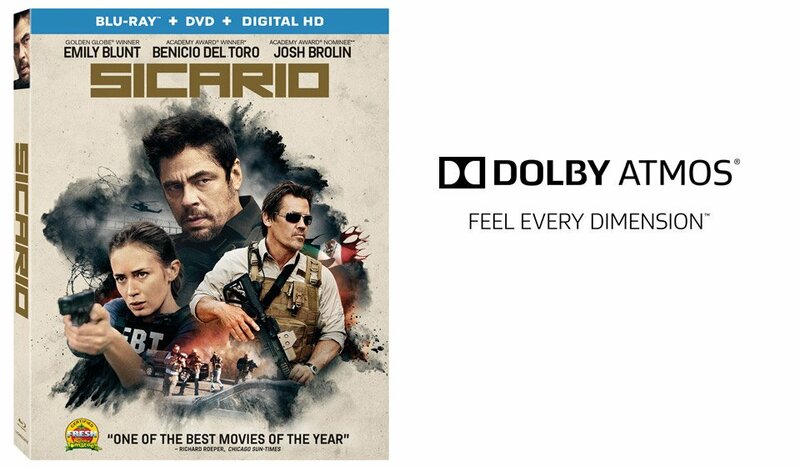 Dolby Atmos brings the thrilling adventures of Sicario to life, placing viewers in the middle of the heart-pounding action at home with detailed, multi-dimensional sound. Whether it’s a high-speed chase, gun fight or an encounter with the cartel, Dolby Atmos puts viewers in the heart of the action. Dolby Atmos is a sophisticated sound experience found in some of the best theaters worldwide and at home. It transports you into the action with breathtaking realism, as moving audio flows all around you in a three-dimensional space. Filmmakers can not only move sound around viewers, but also overhead to realistically depict objects above the audience. Dolby has brought the technology into our homes to make a more immersive and powerful entertainment experience for movie-lovers. Even without an Atmos sound system for the home (although preferred), you will still notice the difference through your television's speakers or your surround sound system when using the Dolby Atmos setting on your Blu-ray.